The Church that God Builds is a six-part series as part of of Aspen Park’s transition plan. The Transition Team is structured as a group of six smaller teams, each focused on a particular topic. Each team is working to compile goals and action plans for the church in one area. Fellowship is sharing things in common with others; most people are familiar with this idea of fellowship. 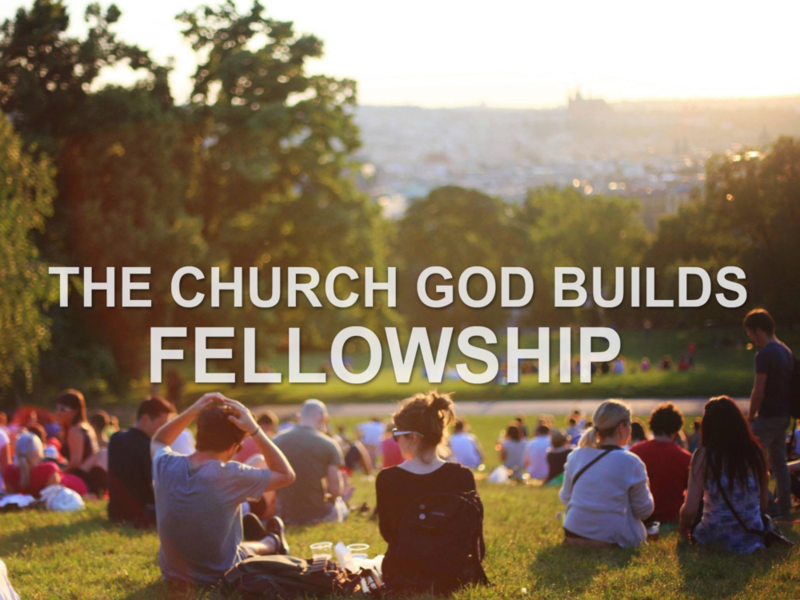 The concept of fellowship exists even outside of a church context, but what we’re looking at this week are the characteristics of Biblical fellowship, or koinonia, with other believers. The fellowship of potlucks- Sharing a meal with others is a fundamental part of life that leads to greater sharing and understanding between people, so don’t discount the power behind a simple potluck gathering. Believers have been sharing meals together since the times of the early church. Getting together just to have a good time is an essential part of sharing your dream, your laughter, and your life with others. The fellowship of emotions- Learn to share your feelings with others, it is what God has created us to do. Join others to rejoice when they have joys and mourn when they have difficulties. Sometimes we may find that’s it’s actually harder to rejoice with others than mourn, but petty jealousy over others’ successes has no place in fellowship. The fellowship of spiritual healing- Catholics have found that confessing your sins often brings spiritual healing; This is a valuable practice that you can do too—find someone you know very well and strongly trust and try confessing your sins to them. Opening up and being vulnerable to God and to your peers can be very healing. Acknowledging and sharing our struggles in Christ helps us heal and overcome them. The fellowship of ministry- Your life experiences have prepared you for ministry with others. Because you have overcome obstacles in your life, you are uniquely qualified to minister to others suffering from the same obstacles. Comfort those in trouble with the same comfort you received from God; just has led you through difficult times or situations, you can support others with the knowledge you have gained. The fellowship of worship- Worship is integral to growing close with God and individual worship is valuable, but communal worship is critical also. When we come together in song as a church, we are like a harmony, each different part forming a more beautiful whole. The fellowship of “one another”- This fellowship is all about how we treat one another: Do we have charity, consideration, and tenderness for each other? It is Biblical to forgive one another, to accept one another, to pray for one another, to submit to one another, to be kind to one another, to bear with one another, not to slander one another, and not to grumble against one another. We are meant to come together and grow as a community of believers, not exclude ourselves or be solitary worshipers. God shepherds us as a flock of sheep and by staying together we do not go astray.